Pisces and Libra would be more happy living in a closed world where everything is beautiful and serene, as the real world often seems to them disgustingly rude and cruel. Both Pisces and Libra tend to embellish the truth - they are not liars, but they look at life with some poetic freedom. Pisces, born of Libra, start life in a well-groomed pond rather than in turbid waters, this awakens their artistic inclinations and makes them appreciate the comfort of life. As a refined sign of air, Libra does not like to dirty your hands, figuring in the unpleasant aspects of relationships. By feeding love to people, but hating conflicts, aggression and self-will, Libra tries to be above such problems and, if possible, soften them. This often means that they do not interfere in conflicts. However, being a sensitive sign of water, Pisces needs to show their feelings, and Libra will have to step into the water, the elements of Pisces, to allow this child to develop as he is supposed to. Otherwise, Pisces will learn to hide their feelings, and this can have disastrous consequences. This mother is in danger of ruining her child! She buys him gifts or new clothes, but he can forget that the little Pisces is much more necessary than another - to know that she is loved and that she is appreciated and understood. Why not say it again? Only it is necessary that the Fish did not create the impression that all revolve around it and rush to fulfill all her desires. As a result, you will get a demanding and capricious child, who in this, perhaps, is not to blame. It is better to gradually accustom it to independence, without which one simply can not achieve something in life. The Pisces are difficult to make decisions, and here she will need help. But it’s so difficult, because the mother of Libra herself is indecisive! But both love to do what pleases others. Both want to like, and in this they are very much helped by their charm. But it will be even better if the mother will be able to teach the Pisces to exercise the same firmness, clearly stating what she wants and what she does not want. Mom-Libra likes to talk, building those or other plans and simply enjoying the conversation itself. Well, Fish is a lover of dreams, for example, how to help everyone around. But her mother, Libra, is far from such idealism. Pisces, like her mother, like everything beautiful, and she, like a creative person, wants to create it. Who knows, maybe she will become an artist or a musician! Well, the mother prefers to be invited to enjoy such things as music or pictures. She likes to arrange excursions that give her child and new impressions, and food for thought. This mother is more sociable than her little Pisces, but thanks to the guidance of the mother, the child will gradually learn to be natural and to have to herself. 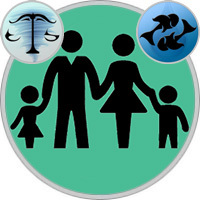 And Libra-mom and the Pisces-child are gifted with a special talent - all to enchant. So they can charm each other too! An optimistic dad-Libra loves his little Fish and wants her to have a better opinion of herself. The father is able to establish good relations with all who need him, and can achieve a lot, thanks to the special ability to choose friends. His child-Pisces will gradually learn from him this art, but he is too shy and needs constant support. The father loves to observe how the living imagination of Pisces manifests, although he himself thinks in a cooler and more logical manner and is not as emotional as his impressionable child. Sometimes he even becomes domineering and tough, which does not fit the Fish, she dreams that the father is always loving and very kind. Any harsh words can not only upset such a child, but also deprive him of self-confidence. Of course, discipline is necessary, but it will be better if Pisces calmly and affectionately explain all the requirements or conditions. This father treats his child-Pisces as if he were already an adult. Of course, you should not be indulgent towards your offspring, but you do not need to demand from him what is still too early for him. Pisces do not grow up so quickly and for a long time they do not become serious or independent. Father-Libra is not inclined to flaunt his problems, because he is very concerned about how it will look from the outside. He can remain silent about any trouble until it becomes unbearable and will not break out. Little Fish intuitively feels when something is wrong in the family, even if they do not talk about it. She even begins to feel that this is her fault, so you need to calm her down, explaining what was happening in time. With Father-Libra, Fish feels naturally and freely, realizing that she will not be forced to do anything that does not fit this subtle, impressionable personality. This father will help the fish to stand firm, and not get lost in dreams and illusions. He likes her caring and generous nature, and he is fascinated by her tenderness! Well, Fish, who grew up next to such a father, will someday remember his childhood as the happiest time of his life.